I am happy to announce that the Corporate 1.0 theme has been officially released – many thanks to those who tested out the beta version. Truthfully, there wasn’t any major changes, so if you have the beta version, you can continue to use that as it is stable. The Corporate is a CMS business wordpress theme, if you are looking for a professional, easy to use, search engine optimized business wordpress theme, the Corporate theme is an ideal one. We are happy to announce that Clover Theme has Launched! 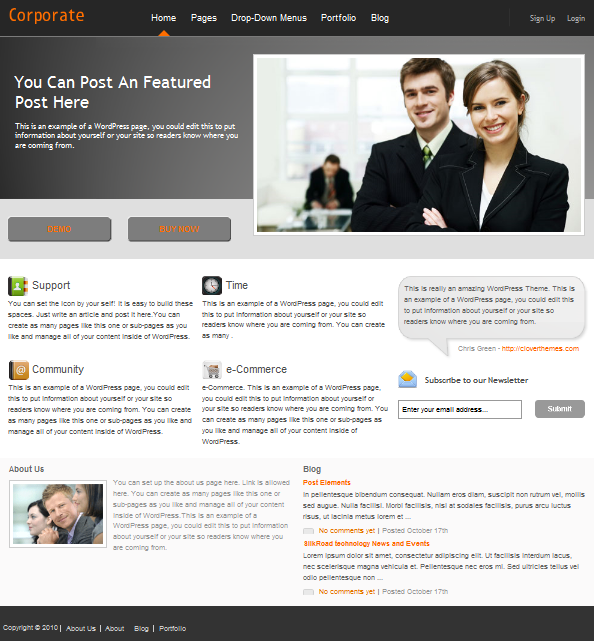 I hope you can find good wordpress themes from our website, and we will design more cool wordpress themes in the future. More and more folks use WordPress to build websites, yes, the wordpress is no longer only a blogging tool anymore, you can find a lot websites are wordpress based. I know you can find a lot free wordpress themes on the internet, but do believe the paid ones can provide good support and designed with details. We Clover Themes, is a small team, 2 designer and 2 programmer, we all love web design and wordpress, we hope we can help you create professional websites 😉 . Our first premium wordpress theme: The Beauty, is an easy to use, simple clean CMS wordpress theme, designed for SPA, salon related websites. Hope you love it.